Very interesting and popular explanation of Shennon limit: Part 1 and Part 2. LACP (IEEE 802.3ad)is protocol used to bundle several physical interfaces to form single logical channel. It has a timer which defines how often devices inter-connected via this bundle exchange LACP PDUs or control messages. Currently, this timer can be set to either "rate fast" - 1 second, or "rate normal" - 30 seconds. What is not always clear is that when you configure "lacp rate " on Cisco or "set interfaces ae1 aggregated-ether-options lacp periodic fast" on Juniper, you do not configure how often this switch will send LACP PDUs. This command means that switch where this command is applied will expect to receive LACP PDUs with this frequency from the partner on the other side of logical channel. Here is quick test. I have Nexus5500 connected to Cat6500. Let's configure port-channel between them with one physical member interface. Cat6500 is configured with rate fast and Nexus5500 - with rate normal. Let's see what's going on behind the scene. F flags says that Cat6500 requesting fast LACP PDUs from its partner. On Nexus it's a little bit backwards, the "show" command tells you partner status, not its own. Nexus5500 says, that its partner - Cat6500 - is sending LACP PDUs every 30 seconds. When troubleshooting multicast problem I find myself checking if IGMP snooping works as intended. "show mac address-table multicast" on Cisco switches shows MAC addresses of multicast groups. Tired of converting Multicast IPs into MACs with pencil and paper, I wrote my first ever script in Python which does just that. It takes IP address of multicast group as a parameter. Although I did some testing there might be bugs, so beware. See Cisco's white paper for explanation how the conversion is done. Finally, in NX-OS 6.0(2) for Nexus 5000 platform Cisco implemented "default interface" command which lets you return interface to its factory default configuration. It is very-very-very useful feature in the lab environment when one has to do a lot of re-configuration and something does not work as expected simply because of left-over configuration from the previous test. 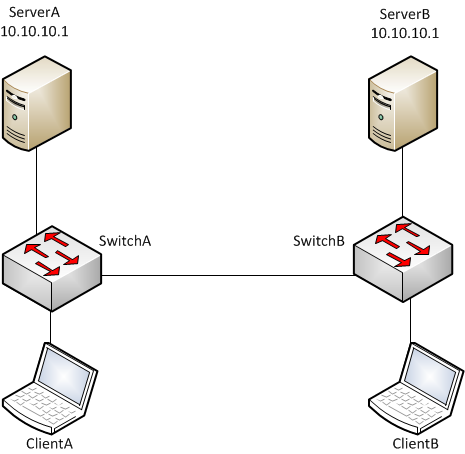 IP and MAC addresses (I know, but splitting network in 2 separate VLANs was not an option) connected to different switches, but in the same VLAN. 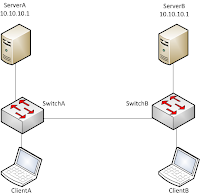 ClientA and ClientB should be able to talk to each other and server connected to the same switch as client. ServerA and ServerB should not even know about each other's existence, so they won't complain about duplicate IP address. The switches are Cisco 6500s. One of the obvious solutions is to put Port Access Control List on either side of the inter-switch link. PACL successfully blocked the traffic between servers, but switches still learned MAC address of the blocked traffic source and placed it MAC address table. This would cause MAC address flapping on the switch every time clients send ARP query for server's MAC or when both servers need to send traffic to their clients. Why would switch need to keep MAC address of the discarded traffic? Oh, well. Another network mystery. annoying message "These secondary vlans are not mapped to the same instance as their primary" every time you run "show spanning-tree configuration". Not a big deal, but things like these irritate me. Not to worry, "private-vlan syncronize" under "spanning-tree mst configuration" will automatically map all secondary VLANs to the same MST instance as primary VLAN. The moment it's done, you MST digest changes and boom, you have brand new MST region and STP convergence on top of it. So, either pick exiting VLAN mapped to the same instance and convert to secondary community or isolated VLAN, or have all your VLANs mapped to MST0 and use other methods to load-share traffic between transit links. I know what you are thinking. No, I did it in the lab, so you won't have to. You can find explanations of what each command does here. port_security-2-psecure_violation: security violation occurred, caused by mac address abcd.ef12.3456 on port gigabitethernet0/46. %PORT_SECURITY-2-PSECURE_VIOLATION: Security violation occurred, caused by MAC address abcd.ef12.3456 on port GigabitEthernet0/46. Port-security violation happened because MAC address has not been deleted from original port yet, hence "duplicate mac-address" message. To mitigate, but not completely alleviate the problem, we can reduce aging timer to 1 minute minimum. It still means that in case of fail-over, the floating IP address will not be accessible for another minute, which could be 1 minute too long.